Ray Archuleta – East National Technology Center, Conservation Agronomist; Soil Quality, Health, Biology and Cover Crops. Reduction of Chemical Inputs through Soil Health. Klaas Martens – Organic Grain and Cover Crop Seed Producer Penn Yan, NY; On Farm Cover Crop Research and Development. Charlie White – Penn State University, Extension Specialist; Cover Crop Combinations of Fava Bean, Red Clover and Triticale, Review Plots at Big Flats PMC and Discuss Plots at Penn State and other On-Farm Research in Pennsylvania. Aaron Ristow – Agriculture Coordinator, Upper Susquehanna Coalition (USC); Cover Cropping within the Chesapeake Bay TMDL Framework. Paul Salon – USDA-NRCS, Plant Materials Specialist. Tour of Cover Crop Demonstration Plots, which includes a Time of Planting Demo with over 80 plots (species, varieties or mixes)with some seeded at several seeding dates. There may be a (to be confirmed) demonstration of an innovative, no-till inter-row cover crop seeder from Penn. State. Supported by an NRCS Conservation Innovation Grant. Directions: Take Route 17 (I 86) to Exit 48 (East Corning/Route 352). Follow Route 352 east for 1.5 miles. PMC entrance is on the left. To Town Hall/Municipal Campus – Route 17 (I86) Exit 49 go south on Bridge St., Make left at “T” onto Maple St., go .4 miles- BF Municipal Campus is on right. The Lewis County and NNY Weekly Crop Update for the week of September 24, 2012 can now be found on the web at: http://www.ccenny.com/index.php/field-crops/growing-season-updates/. September 28, 2012 Hydrofracking: A Discussion on Municipal Preparedness and Planning— Location: Government Law Center of Albany Law School, 80 New Scotland Avenue, Albany, NY from 9:00 a.m. to 3:00 p.m. For more information and to register contact Charles at cgottlieb@albanylaw.edu or 518-445-3263. This program is geared towards training and educating municipal officials on the legal and practical aspects of land use and planning for hydrofracking, whether a locality seeks to ban the practice or plan for potential drilling. Moderators and speakers will be from Albany Law School, Pace Law School, NYS DEC, Sive Paget & Riesel, NYS Comptrollers’ Office, U.S. EPA, and Cornell University Cooperative Extension. September 29-30, 2012 Hudson Valley Garlic Festival, in Saugerties, NY. Open from 10-6 on Saturday and 10-5 on Sunday at the Cantine Memorial field, Pavilion St, Saugerties, NY. For more info visit www.hudsonvalleygarlic.com or call 845-246-3090. October 1, 2012 Greene County Farm Bureau Annual Meeting at Quarry Steakhouse in Climax, NY. Call Bambi @ 518-634-7852 for more info. At 12 noon, in the second half of the training, NYS dairy producer data will be used to demonstrate the online tool that helps farmers and their crop insurance agents decide on the insurance contract to purchase. The University of Wisconsin’s analyzer is available at any time on their website at: http://future.aae.wisc.edu/lgm_analyzer/. Dairy producer questions will be answered throughout. Livestock Gross Margin for Dairy (LGM-Dairy) is a crop insurance program that is based on milk income over feed costs, which the program calls a “gross margin”. The insurance program covers the difference between the expected gross margin (insurance guarantee) and the actual gross margin for the months the producer selects for coverage, based on the amount of milk the producer chooses to insure and feed declared. Enrollment is limited to one contract per month (subject to funding) and occurs after markets close on the last business Friday of that month. The next expected enrollment opportunity for LGM-Dairy is Friday, October 26. Program funding is limited by the program’s pilot status in the current Farm Bill and assigned funding was exhausted in the first hour of the October and November sales enrollment opportunities last year. Remaining funding was used in an August enrollment. October 4th, 2012 Cornell University Maple Production for the Beginner Training Webinars 7-8 p.m. at www.maple.dnr.cornell.edu/webinar Registration & high speed internet is required. No cost. Please contact Stephen Childs at slc18@cornell.edu to register. October 4, 2012 Annual Business Showcase hosted by the Washington County Local Development Corp. will hold its event from 3 to 6 p.m. Oct. 4 at the Christ The King Center on Burton Road in Easton (off Route 40 or County Rte 74). Sponsorships are still available. To register a business for the event, contact the LDC at 518-746-2290 or through this email address: info@wcldc.org. This year’s event is an export showcase, which will feature local businesses that grow or manufacture products locally and export them around the world. The event is free for the public to attend. It is put on in partnership with economic development agencies from Warren, Saratoga and Rensselaer counties. October 4th, 2012 The Dairy Environmental Systems group in PRO DAIRY is holding a workshop titled “Biogas Clean-up and Utilization Systems” at Dutch Hollow Country Club, Skaneateles, NY and Twin Birch Farms, 1839 Benson Rd, Owasco, NY 13021. Registration is required. Cost is $20/person (plus the cost of lunch). We are targeting farmers and others who are familiar with the basic aspects of AD technology. Any ag consultants or engineers planning to be involved with an AD project would also find this course useful. This 1-day workshop will provide participants with information to choose the components of a biogas utilization system, including a biogas clean-up system, to best meet the needs of the farm. Please contact jlp67@cornell.edu or call 607-227-7943to register or for more information. Sunday, October 7th Cornell Cooperative Extension of Rensselaer County will be hosting an open discussion on all things poultry at the Schaghticoke Fair grounds. The discussion will be held from 10am-11am in the show arena during the tailgate sale. Local poultry breeders, experts, and judges will be on hand to discuss topics related to how birds are judged, how to choose a bird for show, what to look for when buying, and much more. The class is free and open to the public, younger people and 4-H members are encouraged to attend. Adults, as well as young poultry enthusiasts will get a better understanding of how to choose birds that meet their needs. Tuesday, October 9, 2012 Agriculture Forum with Congressman Paul Tonko from 7:00 – 8:00 p.m. at Karen’s Produce, 2311 State Hwy 5S, Amsterdam, NY 12010. The meeting will feature a brief update from Congressman Tonko on the status of the Farm Bill, followed by your questions and your concerns. For more info, please contact (518) 843-3400 or (518) 465-0700 or (518) 374-4547. October 10, 2012 Basic Farm Business Management Planning 6:00 – 8:30 p.m. at CCE-Greene Cty. Acra, NY. Helping your farm business achieve success. Registration is $25. For more info contact Gale at 518-765-3500 or Sandy Buxton 518-380-1498 or sab22@cornell.edu. October 16, 2012. Taking Stock: Evaluating Your Resources and Choosing an Enterprise Webinar Series. This five-week an online course series for new and aspiring farmers seeking guidance in the development of a farm enterprise begins on Oct. 16. For more information and to register, visit http://hort.cals.cornell.edu/news-events/beginning_farmer_payment.cfm, www.nybeginningfarmers.org/, or contact ejf5@cornell.edu. October 17, 2012 Schenectady County Farm Bureau Annual Meeting at Turf Tavern in Scotia, NY. Call Jaclyn @ 518-390-6152 for more info. October 19, 2012 Washington County Farm Bureau Annual Meeting at B & B on the Green in Hudson Falls, NY. Call Bill @ 518-935-8569 for more info. Saturday, October 20th, Farming 101 from 9:00 am – 3:30 pm at Cornell Cooperative Extension of Saratoga County, 50 West High Street Ballston Spa, NY 12020. Cost is $30 for the day which includes a delicious lunch and educational handouts. Please RSVP by Oct. 17th to Kirk Shoen, Cornell Cooperative Extension of Rensselaer County at 518-272-4210 ext. 113 or by email to kjs264@cornell.edu . Cornell Cooperative Extension of Rensselaer and Saratoga Counties will provide information on a wide range of topics targeted at small farms that raise beef, poultry, sheep and goats. The topics will include: farm business management, tax exemptions and laws, business development, proper animal selection, animal care, as well as proper pasture and field management. There will be agriculture educators on hand to answer all of your questions. Sessions will include: Growing a Successful Landscape Business -Landscape Management Network, George Urvari, President and CEO of Oriole Landscape. Location: Brovetto’s Dairy Farm/Harpersfield Cheese 1677 County Highway 29, Jefferson, NY 12093 Class limited to fifteen (15) persons – $100/person. Discount for Guild Members (scholarships available). Lunch is included. For registration contact Linda Smith at 607.829.8852 or email the Guild at info@nyfarmcheese.org Participants learn how to make three (3) to four (4) styles of cheese with expert Cheese Makers during this full-day session. Feel free to bring your own farmstead milk. October 27th and 28th, 2012 Game of Logging: Professional level chainsaw safety training for farmers and landowners being sponsored by Washington County SWCD and Ag Stewardship Association and funded in part with a Farm Credit East Ag Enhancement grant. Class will meet from 8 am to 4 pm at 190 North Road in Greenwich, NY. Lunch will be provided as well as hot and cold beverages. The sizes of the classes are restricted to ten people per instructor so we will have the capacity for 20 trainees per day. So, if you plan on attending this valuable training, register early at agstewardship.org to reserve your place. For those without computer access you may call the District at 518-692-9940 ext 123 or ASA at 518-692-7285. October 30, 2012 Cornell University’s Feed Dealer’s Meeting at CCE-Saratoga’s Training Center, Middleline Road, Ballston Spa, NY. Registration fee. For more info or to register contact Richard Smith at 518-885-8995. Tuesday, December 18, 2012,– Improving Your Business With On-Farm Research- at The Century House, Rte 9 Latham from 9:30 am – 3:30 pm. Learn how to do your own on-farm research and how to participate in state-wide research projects with Cornell faculty. We will discuss the skills, knowledge, and management it takes to do on-farm research. Put on by Capital Area Agriculture and Horticulture Program. Mark your calendars. Registration information is forthcoming. Contact Aaron Gabriel if you have questions, adg12@cornell.edu, 518-380-1496. Chinery at dhc3@cornell.edu and 518-272-4210. March 6, 7 & 19, 2013 CNLP (Certified Nursery Landscape Professional) Review Session with Cornell Cooperative Extension – Albany County, 24 Martin Road, Voorheesville, NY 12186. A 2-day review session and exam. Topics include botany, soils, and plant identification. This review session will prepare students for the CNLP exam. Registration required. For more information about the training and the CNLP program, contact Chuck Schmitt at cds34@cornell.edu and 518-765-3513.
http://dyson.cornell.edu/outreach/order.php The price is $16, with checks payable to “Cornell University” and sent the following address: Linda D. Putnam, Extension Support Specialist, 216 Warren Hall, Charles H. Dyson School of Applied Economics and Management, Cornell University, Ithaca, NY 14853-7801 or 607-255-8429; fax: 607-255-1589; ldp2@cornell.edu. Thank you for your continued interest in the Dairy Farm Business Summary and Analysis Project. UVM Center for Sustainable Agriculture is Hiring – The UVM Center for Sustainable Agriculture invites applications for our new Farming and Climate Change Coordinator position. The Coordinator will provide leadership for the Center’s new Climate Change program by developing, implementing and evaluating programmatic efforts. This will require engaging in outreach and applied research with Vermont farmers to support their efforts to implement relevant practices (both adaptation and mitigation) related to climate change, with a particular emphasis on farming in the floodplains; and 2)working in collaboration with other agencies, organizations, and UVM departments. Demonstrated skills in program development and design, program implementation and evaluation, collaboration, applied research, grant writing and leadership desired. Requires excellent written and oral communication skills, networking skills, ability to travel in the region, experience working with all types of farms including fruit, vegetable, livestock and crop farms, in-depth knowledge of sustainable agriculture issues relevant to small diversified farms, and ability to work and understand the multi-faceted nature of farming from economic, social and environmental perspectives. Desirable candidates will have a minimum of Master’s degree in Plant and Soil Sciences, Agroecology, Community Development and Applied Economics, Horticulture, Natural Resources, environmental sciences or related field and 3-5 years of relevant experience. Must be familiar with climate change issues affecting Northeast farming systems. Should be aware of other programmatic efforts to reach farmers in the state. Applications from women and people of diverse racial, ethnic, and cultural backgrounds are encouraged. Applicants must submit the following materials online at the UVM jobs website: Resume, a cover letter outlining interest and relevant experiences, and the names and contact information for three references. Applications due by October 5th, 2012. USDA Announces Hispanic and Women Farmer and Rancher Claims Period Now Open – Agriculture Secretary Tom Vilsack today announced that Hispanic and women farmers and ranchers who allege discrimination by the USDA in past decades can file claims between September 24, 2012 and March 25, 2013. Call center representatives can be reached at 1-888-508-4429. Claimants must register for a claims package (by calling the number or visiting the website) and the claims package will be mailed to claimants. All those interested in learning more or receiving information about the claims process and claims packages are encouraged to attend meetings in your communities about the claims process and contact www.farmerclaims.gov or phone: 1-888-508-4429. Claims Period: September 24, 2012 – March 25, 2013. Independent legal services companies will administer the claims process and adjudicate the claims. Although there are no filing fees to participate and a lawyer is not required to participate in the claims process, persons seeking legal advice may contact a lawyer or other legal services provider. You are receiving this newsletter as a service of the ENY area covered by the Capital Area Ag & Horticulture Program – Albany, Columbia, Greene, Schenectady and Washington Counties. Every effort has been made to provide complete, accurate and timely information. No endorsement of products or businesses are implied. No solicitation allowed. Learn and see how to grow fall sown oats and winter grains for forage. Which fields are most suited for winter forage? Is it worth planting shorter season corn? Discuss a remarkable 2012 growing season with neighbors. Wednesday, Oct. 10 at 1 pm, Foothill Farm (Bill Gorsky), Easton, Washington County. At the oat/triticale field east of the barn next to house at 1380 Vly Summit Rd. Tuesday, Oct. 16 at 1 pm, A. Ooms & Sons, 215 Rte 28A, Valatie, Columbia Co. Look for the CCE sign at an oat field west of the farm on Rte 28A. Call Aaron Gabriel, 518-380-1496, for questions and to RSVP so there are enough materials for all participants. The Capitol Area Ag Report for September 27, 2012 is now available online. Click here for the most recent issue. Last week, temperatures were 3-6 degrees below normal for most of the state. Parts of eastern and northernNew Yorkwere closer to normal, but still below average. Precipitation was highest over the Catskills, where over 3″ fell. Most other areas got 1-3″ with a few localized areas seeing less than an inch. Base 50 Growing Degree Days were less than 50 statewide except for Long Island, which saw 75-100. Today will be a quiet day as the region will be between systems. High temperatures will generally be in the 60s with some sunshine. Overnight lows will be in the mid 40s to low 50s. A storm system will bring an area of rain tomorrow, with the core of the rain roughly passing from the Southern Tier intoEastern New York. High temperatures should mostly be in the 60s. Overnight lows should be mainly in the 40s, though some 30s may be possible across southwestNew York. Frost is not expected. A few showers will be possible on Saturday, but most areas will see little to no rain. High temperatures will be in the low to upper 60. Overnight lows will again mainly be in the 40s with a few isolated spots dipping into the 30s. There will be a higher chance for rain on Sunday, especially across western and southern New York. High temperatures will be in the 60s for most, though areas in the rain may stay in the 50s. Low temperatures will stay in the mid to upper 40s. A few left over showers will be possible on Monday, with dry weather Tuesday and Wednesday. High temperatures will be in the low to mid 60s Monday, but should warm into the upper 60s Tuesday and 70s by Wednesday. Overnight lows should generally be in the 40s all three days. Overall, through the next week, the chance of frost appears low. The 5 day precipitation totals will generally be less than ½” across western and northern New York. Areas across southeastNew Yorkcould see a couple of inches of rain. The 8-14 Day outlook calls for near to below normal temperatures with above normal precipitation. Saturday September 29, 2012 Got Drugs? From 10 a.m. – 2 p.m. Visit www.dea.gov or call 800-882-9539 for more info. Many local Sheriff/police departments are holding a drug drop-off event to help remove drugs from households as well as make sure there is safe disposal of both human and animal drugs of all types which does not hurt the environment. Please bring items to designated locations or watch for the next event. Oct. 12, 2012 Brewing and Science Technology CCE Short Course – from 8-4:45, at Jordan Hall, NYS Ag Experiment Station, 630 W. North Street, Geneva, NY 14456. Registration course cost and included meals $100/person. For more info, contact Gemma Osborne at 315-787-2248 or gro2@cornell.edu. Tuesday, December 18, 2012,– Improving Your Business With On-Farm Research– at The Century House, Rte 9 Latham from 9:30 am – 3:30 pm. Learn how to do your own on-farm research and how to participate in state-wide research projects with Cornell faculty. We will discuss the skills, knowledge, and management it takes to do on-farm research. Put on by Capital Area Agriculture and Horticulture Program. Mark your calendars. Registration information is forthcoming. Contact Aaron Gabriel if you have questions, adg12@cornell.edu, 518-380-1496. January 12, 2012 Basic Farm Business Management Planning 6:00 – 8:30 p.m. at CCE-Washington Cty. 415 Lower Main St, Hudson Falls, NY. Helping your farm business achieve success. Registration is $25. For more info contact Gale at 518-765-3500 or Sandy Buxton 518-380-1498 or sab22@cornell.edu. For more information contact mailto:sustainable.agriculture@uvm.edusustainable.agriculture@uvm.edu. Oneida County Large Grazing Group – A group of grazers is starting a large herd grazing group centered in Oneida County. The group is looking for farms that are grazing more than 100 milking dairy cows, would be interested in looking at other operations around the state, willing to host a pasture walk or a meeting at their farm once every 2-4 years, and meet 1-2 times per year. Interested farms would be required to participate in the Dairy Profit Monitor (DPM) program or the Dairy Farm Business Summary, through Cornell University. If you would be interested in this group please contact Bill Paddock of Oneida County Soil & Water Conservation District at (315)736-3334 or by e-mail at william-paddock@oneidaswcd.org . The plan is to have an organization meeting in late September or early October 2012 with any interested farmers. Marketing Directory: Farmers can network with sheep and goat buyers, processor, auction barns, and livestock haulers. Producer Directory: Farmers can promote their products and animals. Classified Ad Section: Advertising market animals for sale or orders that buyers need to fill. Calendar: Dates and marketing information for holidays. Education: Wide range of information on marketing and processing, evaluating animas, management, and more. Visit the site at www.sheepandgoatmarketing.info! The 2012 Crop Chronicle is now available online. Click here to access. The 2012 Crop Chronicle includes results of applied research and educational outreach pertaining to growing and managing pests and diseases of soybeans supported by funding through the United Soybean Board and NYCSGA. Once again there is a line-up of diseases this week. In corn we are finding northern corn leaf blight, northern corn leaf spot, gray leaf spot and various kinds of stalk rots. One disease found at the Cornell Research Farm this fall was northern corn leaf spot. The symptoms are linear narrow lesion about a 1/8 to ¼ inch wide. They range from a ½ to ¾ inches long. They are grayish-tan and have a pigmented border. The lesions exist between the veins and are linear in appearance. The fungus is Bipolaris zeicola (Helminthosporium carbonum) and has five different races that can infect the plant. The fungus overwinters on corn crop residue from previous years. 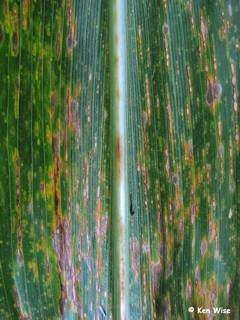 Management of Northern Corn Leaf Spot. Plow under residue to reduce fungi in the field. In soybeans there are reports of white mold and soybean vein mosaic virus this week. Most of the reports of soybeans with white mold have come from Eastern NY. Soybean vein mosaic virus is being found statewide and in most fields. I found English grain aphid in triticale this week. English grain aphid is one of the aphids that can transmit barley and wheat yellow dwarf. Triticale can be infected like all other cereal grains and even grasses. Triticale does not always show symptoms like you might see on wheat and barley. Last week temperatures ranged from 0 to over 3 degrees above normal for most of the state. Rainfall amounts ranged from 1 to 2 inches for most of the state; western NY had less than an inch; the Catskills and surrounding areas had over 2 inches. The Base 50 growing degree-days ranged from 50 to 100, les than 50 in the Adirondack region. Today will be sunny with temperatures in the upper 60’s and low 70’s. Overnight temperatures will be in the mid 40’s to low 50’s. Friday will be mostly cloudy with highs in the low to mid 70’s. Some scattered showers are possible as a weak cold front moves over the state. Lows will be in the low to mid 50’s. Unsettled weather over the weekend; westerly winds could bring lake enhanced showers. Saturday’s temperatures will range from the upper 60’s to mid 70’s with scattered showers and thunderstorms possible as a stronger cold front moves through. Lows will range from the mid 40’s to mid 50’s. Sunday highs will be throughout the 60’s with scattered showers. Overnight temperatures will be in the upper 30’s to mid 40’s. Monday will partly sunny with temperatures in the 60’s. Lows will be in the low to mid 40’s. Tuesday will be mostly sunny with temperatures in the mid 60’s to low 70’s. Lows will be in the 40’s. Wednesday temperatures will in be in the mid 60’s to low 70’s. Lows will be in the mid 40’s to low 50’s. The five-day precipitation amounts will range from 1/10 of an inch to 1 ¼ inches. The 8-14 day (Sept 27-Oct 3) outlook is showing normal temperatures and above normal precipitation. The Western Bean Cutworm (WBC) trapping season has come to an end for 2012. Counts this week remained essentially the same as last week with most sites still in operation reporting “0” moths. What’s next for WBC larvae? As WBC larvae mature they will stop feeding, drop off their hosts and burrow into the soil to overwinter. In late summer and early fall, 6th instar WBC larvae drop off their hosts and burrow into the soil, where they construct earthen chambers where they will overwinter. These soil cells are about 5-10 inches beneath the soil. Sandier soils allow larvae to penetrate deeper into the soil profile. The underground overwintering location provides greater protection from winter temperatures and tillage equipment and increases overwintering survival. The larvae remain in their pre-pupa state throughout the winter, then pupate and complete development to moths the following summer. Surviving insects should begin to appear in our moth traps about the last week or so of next June. Total number of WBC (male) moth catches was 3,458, more than 2X last year’s catch. Peak WBC flight this year was about 1 – 2 weeks earlier than that observed in 2010 and 2011 (August 2) See figure below. Earlier emergence and activity probably related to the warm temperatures in spring and early summer. The majority of WBC moths captured statewide were in very good condition indicating there are locally overwintering populations. These populations appear to be relatively small to moderate in size with the majority of locations catching less than 50 WBC moths / trap. Several western and northwestern NY sites had very high captures this season (> 150). A high percentage of moths captured in these high count locations had damaged wings suggesting they had travelled some distance and were likely migrants. Very few egg masses were found this season (Franklin County) and none of those fields were over threshold (field corn: 5% field infestation with egg masses and/or small larvae). There have been reports of WBC larvae in sweet and field corn ears. So far WBC economic damage has not been detected this season although it is still quite early as dry bean and corn harvest has only just begun. We are very interested in documenting any economic impacts associated with western bean cutworm this season. If you believe you have WBC larval damage and suspect economic losses we would like to hear from you. Please contact your local Cornell Cooperative Extension field crops educator. Check regrowth of established alfalfa stands for potato leafhopper, weed and disease problems. Barn fly issues tend to spike when fall temperatures drop and flies seek warmer locations. To avoid establishment of fly populations pay close attention to barn sanitation and other cultural practices to minimize fly breeding habitat. Pasture fly issues tend to drop significantly when fall temperatures drop, particularly after the first frosts. House, stable and perhaps some horn flies will seek warmer locations such as barns. Monitor animals for presence of pasture fly pests. Treatment guidelines: Horn flies (50 per dairy animal side, 100 per side for beef cattle), face flies(10 per animal face), stable flies (10 per 4 legs). See IPM’s Livestock page. If you are unable to reach a Poison Control Center or obtain the information your doctor needs, the office of the NYS Pesticide Coordinator at Cornell University, 607-255-1866, may be able to assist you in obtaining such information. The Lewis County and NNY Weekly Crop Update for the week of September 17, 2012 can now be found on the web at: http://www.ccenny.com/index.php/field-crops/growing-season-updates/.